The image shows the sensory neurons in Drosophila larval eye imaginal disc and brain ganglia. The eye brain complex from G147 larvae having endogenous GFP were stained with DAPI and TRITC-Phalloidin. Rab11, a small GTP binding protein, plays important role in vesicular trafficking. 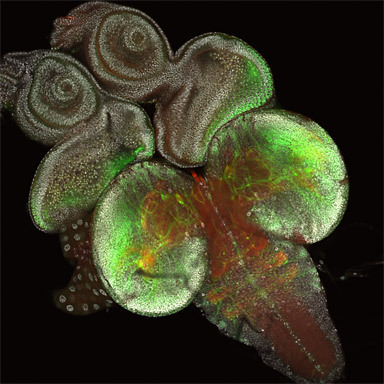 The role of this protein in Drosophila eye development and in other developmental processes is being carried out. An LSM 510 Meta Laser Scanning Confocal Microscope was used to visualize sensory neurons and actin organization in Drosophila eye-brain complex using multiple fluorophores.